Hi Fluffy Kitty family! Today’s guest post is written by our friends over at Catexplorer. It’s a common sight in many parks – dog owners walking their 2 dogs, by themselves. Then as cat owners, we think there is no way we could walk our 2 cats together. They’ll want to go in opposite directions, their leashes will get tangled and they will want to climb different trees. It just sounds like shambles! But, it doesn’t have to be this way. 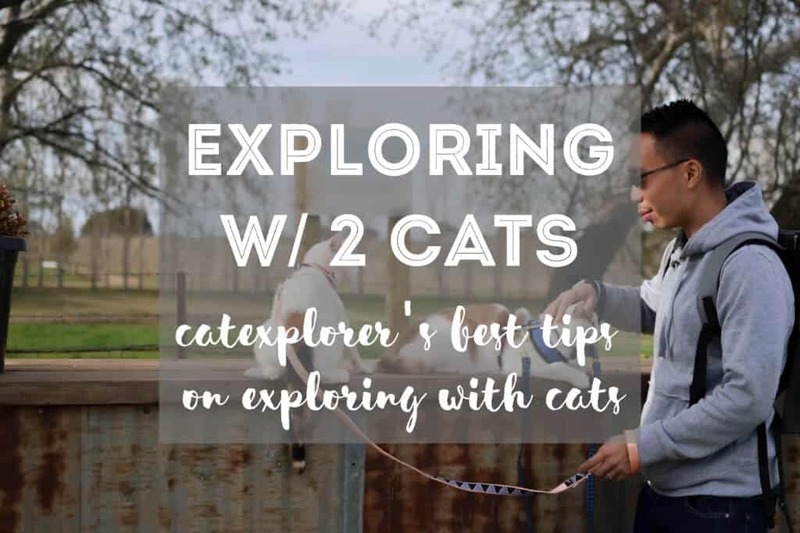 You can go exploring with 2 cats and it can be fun for everyone involved. We do this all the time with our 2 cats, Lumos & Noxie. It may not look like walking 2 dogs, but walking a cat is nothing like walking a dog anyway. But like a dog, cats need training to explore together. While it is possible to train 2 cats together, we have found that it is much easier to initially train the cats separately. Cats are like humans, they each have different personalities & needs and you may have to adapt your training techniques. 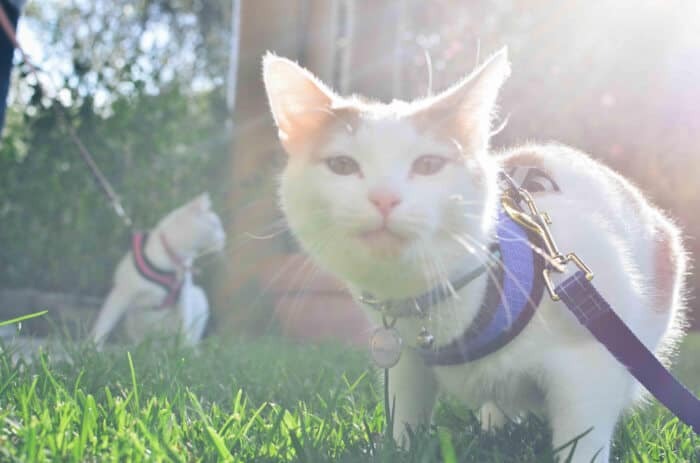 In our situation, Lumos was much more confident and didn’t mind any harness, while Noxie was picky with her harnesses and it took longer for her to relax while walking. The first step is to harness and leash train each cat. Pick an appropriate harness for your cat. Create a positive association with the harness by using something they love like treats or play time. Practice wearing the harness at home while giving them lots of yummy treats. Introduce your kitty to exploring outside. Start with a small area and slowly make your way up to locations with more stimulation. You can conduct steps 1 to 3 with both your kitties at the same time. However, we recommend you do step 4 separately. This helps ensure that you can pay attention to each cat, understand their moods and react accordingly. Prior to exploring with a cat, we recommend that you provide your cat with a safe spot to retreat in when they are nervous and you train them to do so. Majority of the Catexplorer community use a cat backpack or a cat stroller as a safe space for their cat. Not only are these great places for your cat to retreat into when they are nervous, but they also double as a way to transport them when they don’t want a walk or when it is unsafe for them to walk. Depending on the relationship between your 2 cats, you can conduct backpack and stroller training together. In fact, it might even help them to watch each other. Lumos was much more accepting of the backpack, while it took Noxie some time to accept it. Like with harness training, we recommend you initially use positive reinforcement to train your cat to use their backpack at home. Lumos and Noxie really started to enjoy using their backpacks when we took them to a local park with the backpacks. They realized that the backpack meant that they could go exploring, which they love. Like we said, walking a cat is not like walking a dog. Cats like to stop suddenly, sniff everything and eat every blade of grass. On top of this, many cats do not walk in a straight line. In order to explore with 2 cats, it would be ideal if they walked in a straight line together, otherwise, you end up being split in half or all tangled up. Find a quiet tight trail. Use positive verbal language to encourage them to walk in a straight line. This may take some time. When they walk in a line, give them a lot of praise and treats. Continue this process until they learn to walk in a straight line. Yes, this does sound easier on paper than it might be in practice. However, with time, you will have 2 kitties who both walk in a straight line, meaning less leash tangling. Maybe this will even give you an opportunity to use a leash splitter, which means that you will not have to hold 2 leashes! Each cat has their own personality and they react to situations differently, particularly outside. We definitely find this with Lumos and Noxie. When they see a dog, Lumos will fluff up and act as the guard cat while Noxie will get as small as possible and retreat. While you are training your cats to explore one on one, it gives you an opportunity to see how they respond to different stimuli. This will help you be prepared for when they start exploring together, especially when you need to react quickly. Once both your cats are walking really well, it can be tempting to grab them both and get exploring. Given that they have never adventured together before, we recommend starting small, perhaps with the first location, you took them exploring separately. This will help you (and your cats) understand the new dynamic. It is also a great opportunity to try the skills you trained them like walking in a straight line. Once you and your kitties have become comfortable, you can slowly start introducing them to new locations with more stimuli. To make it easier for you, we suggest you explore with one human per cat. This gives you the flexibility to concentrate on one cat each. We also like that it gives you an extra set of eyes to watch for stimuli that might scare your cats. This is how we explore with Lumos & Noxie. This allows us each to take responsibility for one cat and keep an eye out for stimuli that might scare or overly excite them. It is possible for one person to walk 2 cats. Typically this means that one cat is in a backpack or stroller while the other is walking on a harness and leash. However, if both cats are comfortable with it and the situation is suitable, both cats can walk together too. You know your cats best. You know their relationship. You know how they react to their environment and to stimuli. You are the person in the best situation to decide whether you can walk them by yourself or if you need a walking buddy. It is possible to go exploring with 2 cats. As with anything in catexploring, it does require training – for the cats and humans. We have found exploring with both Lumos & Noxie to be one of the most enjoyable aspects of catexploring. Seeing them enjoy exploring together has been so rewarding and is why we continue to do our best to give them the world. Hasara Lay is the Founder & Chief Explorer at Catexplorer, a community & movement for people who explore the world with their cats. 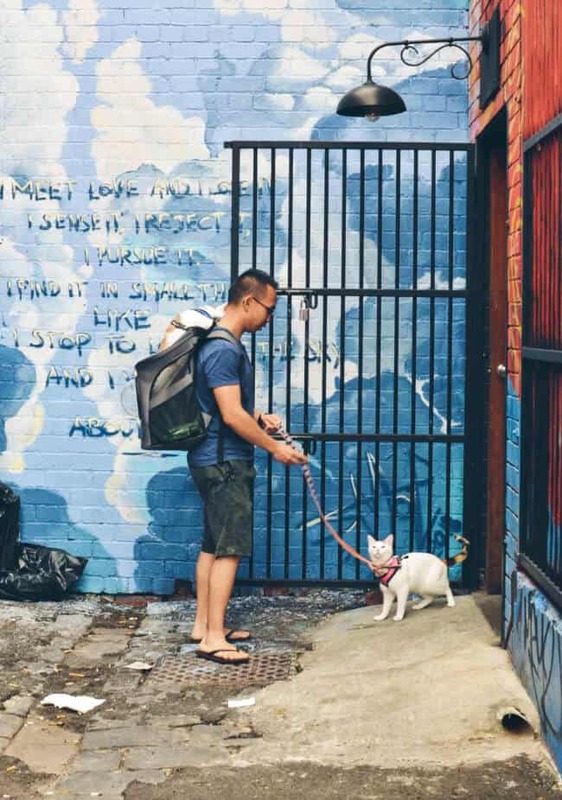 We’re pet owners who aim to give our cats the world by taking them exploring on hikes, to book stores, to brunch and so much more. Hasara is also Mummy to Lumos & Noxie.